July 4th is coming! 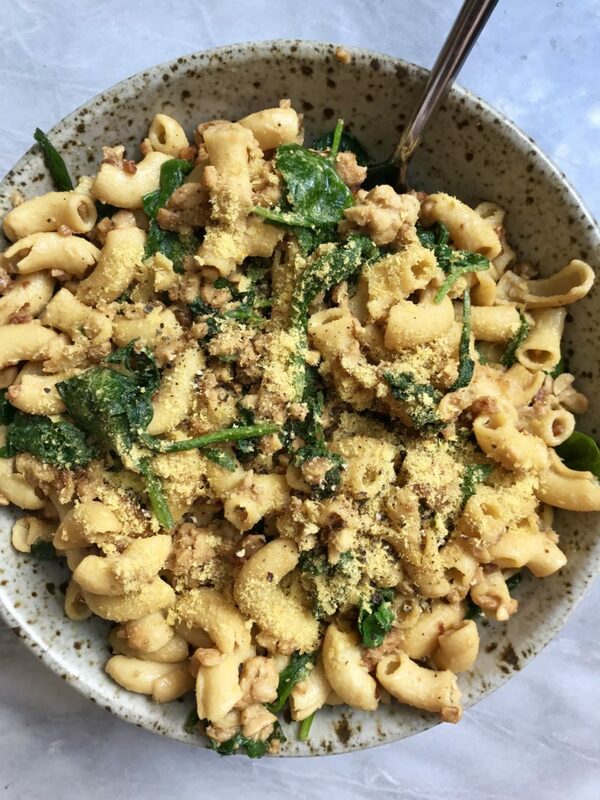 Here is a delicious and easy “cheesy” pasta salad with tempeh bacon crumbles and spinach. I haven’t posted a pasta recipe in forever, so I thought one for July 4th would be fitting. 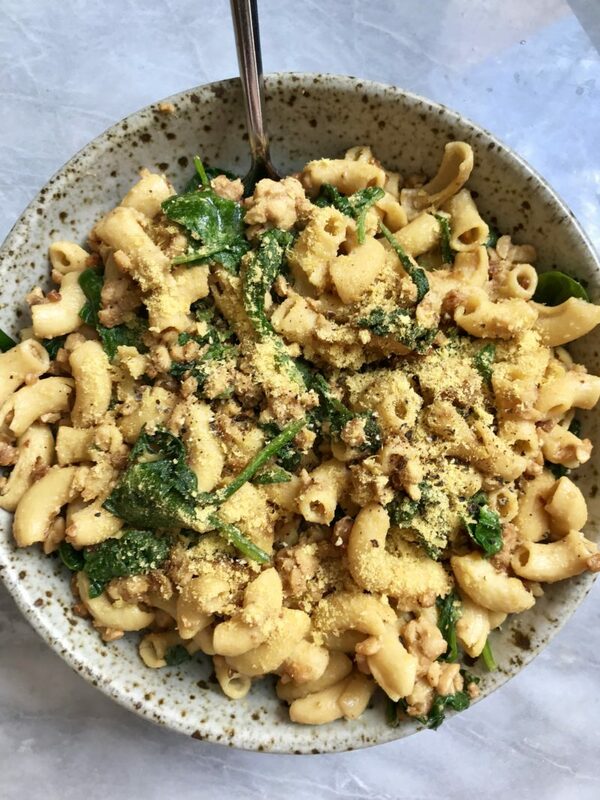 This delicious cheesy pasta with tempeh bacon crumbles and spinach takes around 20 minutes to make. It’s the perfect side dish for your July 4th BBQ needs. Tempeh is a great ingredient to make bacon with. It absorbs the soy sauce, liquid smoke and spices to create a delicious smokey bacon replacement. I absolutely love it! 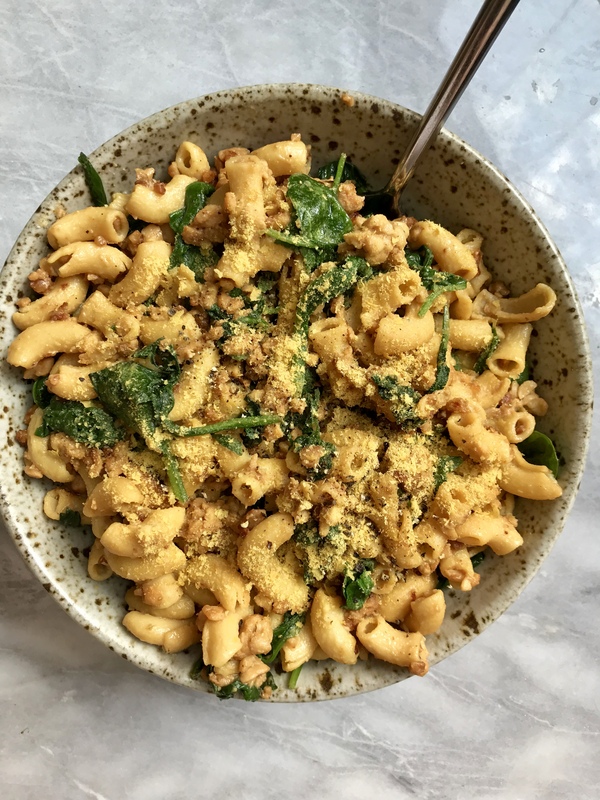 There is no vegan cheese in this recipe, but just some handy nutritional yeast. If you want to learn more about the importance of nutritional yeast in a Vegan diet, click here. Bring a large pot of water to a boil, and cook pasta according to pasta instructions. Heat up a medium sauté pan with a little oil on medium heat. Crumble in your tempeh and cook for 2-3 minutes. Combine your soy sauce, liquid smoke, onion powder & garlic powder in a small bowl. Pour sauce over tempeh and cook until the tempeh is browned and the liquid has absorbed. Add in your spinach and let wilt. Turn off the heat. When your pasta is done, drain it and put it back in the pot. Add in your vegan butter, nutritional yeast & salt/pepper to taste. Mix to combine. Taste to see if you need more nutritional yeast or salt/pepper. Once it's done, add it to the saute pan with your tempeh and spinach. Fold everything gently until well combined. Serve!